Here you will find a selection of our Slogan Vests & Tees. Be sure to check back regularly as we will be adding new designs and some limited editions. Apparel | Clothing There is 1 product. Daddy Do My Hair? 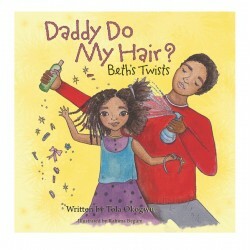 Join Daddy and Beth on a wonderful hair adventure in this heart-warming story, which celebrates the unique and special relationship between a father and a child. The perfect rhyming picture book to be shared time and time again. The perfect book for little girls everywhere!